Kitchen Tools That Help The Environment. Like everyone else, Green Street Brand Producs want to help protect the environment. That’s why they introduced the Green Street line of kitchen tools and utensils. The goal? To reduce carbon footprint, the amount of greenhouse gases released into the atmosphere, and provide retailers with environmentally friendly products consumers desire. What makes a product “green”? In the case of Green Street kitchen tools and utensils, there are two major ways they’re reducing the impact on the environment. 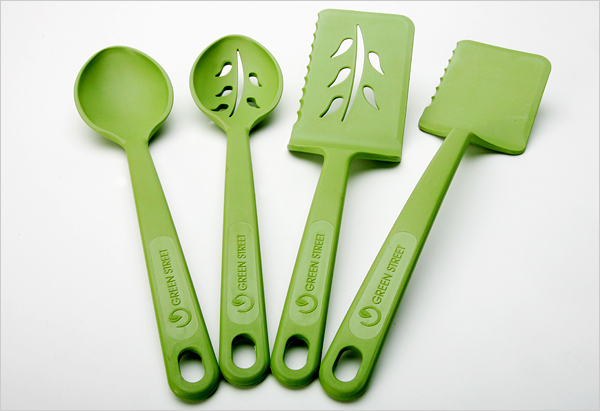 First, all Green Street utensils are made from recycled plastic water bottles. Saving the oil that would be used in making new plastics, and reducing the amount of plastic waste that goes to landfills and incinerators. Second, Green Street Brand Producs structured their manufacturing and transportation network to dramatically reduce use of fossil fuels. By using naturally generated power whenever possible and keeping transportation distances short, they can reduce carbon footprint by lowering emissions of greenhouse gases. The plastic bottles used for bottled water are made from plastic, or more technically a thermoplastic called PET made from petroleum. Every year in the U.S., manufacturing these water bottles uses enough crude oil to power 1 million cars. By recycling those bottles, they reduce the amount of oil America needs. The used plastic bottles are collected and compressed, then shredded. The recycled plastic is fed back into a factory that adds materials to make the plastic more stable and both heat and stain resistant, important qualities for use in kitchen tools. Next, this recycled plastic, in the form of pellets, is shipped less than 750 miles to the manufacturing plant in Ontario, New York. By keeping transportation distances short, once again they use less fossil fuel and reduce greenhouse gases. To further reduce harmful emissions, the factory uses both a windmill and natural gas generators to make its own power. Then, once the factory turns the recycled plastic into attractive, long-lasting kitchen tools and utensils, they ship them less than 100 miles to the Buffalo, New York warehouse using trucks fueled by biodiesel, a more environmentally friendly fuel made in part from renewable resources.